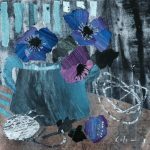 Marzia was born in Italy and studied at the Accademia di Belle Arti in Florence before moving to England which has been her home for over 30 years. She is both a sculptor and an artist working in collage. Her powerful bronze pieces reflect the dreams and aspirations of mankind and the profound truth of the human condition. She has exhibited throughout the UK and her numerous public commissions include the Kite Flyer for Winchester and the Crucifixion in Salisbury Cathedral. 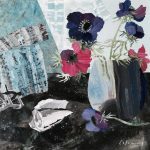 She draws inspiration for her collages from the flowers in her garden, the interior of her studio and most of all the coastal landscape here and in her native Italy. Her collages draw us in, letting us feel what moves her, whether a landscape or interior, we become part of a moment in time. 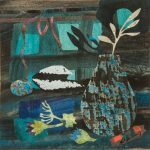 Her disciplined approach to collage underpins the work with a strong abstract quality of mark and pattern. Then paper she uses is painted by her before being ripped and cut. 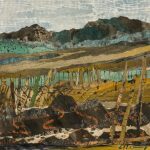 ‘When I work with collage I feel I am sculpting with paper and painting at the same time. After looking for a long time at my subject matter. 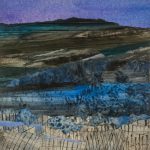 It is fast and furious work; holding on to and trying to replicate the memory of the landscape that I have experienced, not just visually in its form and colour, but also in the impact created in my mind by the wind, sun, rain, smells and sounds’.